This guide will teach you how to buy FUN from square one (i.e., all you have is fiat money, no cryptos). It will also work for most other cryptocurrencies, but as I’m interested in FUN right now, I am going to write a quick foreword about it and then we’ll get right into the meat of the guide. A Little About FUN — Why Buy? There is a massive subset of people who are new to the crypto-space entirely but have only heard of Bitcoin. Then they go online and they search around and figure out there are actually many, many cryptocurrencies out there with many different use cases. FunFair’s use case is in the online gambling or, as they like to call it, “online gaming” industry, and is one of the most exhilarating coins I’ve reviewed so far. Online gaming is a colossally lucrative industry throughout the world. With respect to this, I actually have some deeply personal reasons that FunFair interests me. Believe it or not, online gambling is the use case that first got me thinking about cryptocurrency way back in 2013. I had intentions to create a provably fair Bitcoin casino — something that I imagined would make me a great deal of money. Due to legality questions regarding gambling with cryptocurrencies, I ended up pursuing other projects instead. Still, when I see a specific coin working towards revolutionizing this industry, I get excited. The thing about online gaming is that the laws around it are a bit complicated. You need to know certain things, like the difference between a “game of skill” and a “game of chance” — what’s a sweepstakes versus a contest versus a lottery? Some of these things are legal, some of these things are legal under certain circumstances, and some of these things (a lottery) are basically always illegal. It gets even more complex with specific games like online poker, where American laws center around whether or not it’s legal to accept money from customers rather than whether it’s legal to gamble on the game. You can see why I didn’t pursue this stuff a few years ago! The concept is still fascinating though, and I may still end up running a casino before too long — and I may even use FUN to do it! You see, FunFair intends to bring online gaming to the blockchain in a way that is “fun, fast, and fair” according to its commercial whitepaper. The FunFair online casino gaming platform will run 3D games running via HTML5. According to the whitepaper, operators will be able to publish online casinos in “two clicks” — I have my doubts that it’ll actually be this easy, but if they can simplify the process for bringing an online game to market, that is extremely valuable. Because the platform is an “open architecture” it should be easy to develop games for it. Finally, this platform is intended to be much cheaper “per bet” in fees than existing platforms — as you can imagine, there are plenty of Bitcoin casinos out there, but fees for guest users are likely out of control given the turmoil on the Bitcoin blockchain right now. The FunFair platform will be based on the FUN token. This is an ERC-20 token which is therefore administered by smart contracts on the Ethereum blockchain. This has consequences for wallet storage — we’ll get into that later. For now, I’m going to finish up with a quick price analysis. At the time of this writing, Cardano is ranked #5 on coinmarketcap with a market capitalization of $28,721,490,201. If FUN had Cardano’s current market cap, it would be worth almost $7 per FUN. That’s around 41 times the current price (less than $0.18). Don’t think FUN can become a top five coin? Just remember, the online gaming industry is enormous and, in addition to darknet markets, is exactly where Bitcoin made its bones in the beginning. FUN not only brings value into a multi-billion dollar industry, it’s pretty cheap right now — and it’s always nice to get in on the ground floor of a coin in case it does balloon in value. With that said, let’s see about getting some. Create and sign in to a Binance account. I recommend Binance because they have been reliable and convenient for me and they offer many different lesser-known cryptocurrencies with trading pairs on both ETH and BTC. An added bonus is that you can withdraw up to 2 BTC/day worth of funds with no verification at all. Alternate exchange options: HitBTC also trades FUN— I have written a guide to using HitBTC which you will find useful. Move your ETH to Binance. 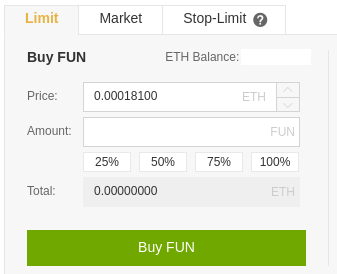 Once it has confirmed, you can now easily use the ETH/FUN trading pair to buy as much or as little FUN as you want. More on trading pairs later. Send your coins from Binance to a safe FUN wallet for long term storage if you intend to hold for awhile. This is not strictly necessary but it is considered a safer option than keeping ANY coin on ANY exchange long term. I personally believe Coinomi to be the safest and most convenient wallet for many cryptocurrencies, including FUN at this time. There are some caveats to this when it comes to ERC-20 tokens like FUN, which I will detail later. Once you are up and running there are a number of options when it comes to actually paying for coins via Coinbase. It is possible to link your bank account to Coinbase but actually transferring coins out of Coinbase will be impossible for a few days while the funds are clearing. This is obviously not ideal if you want to move quickly, as you would now have to wait several days to move your coins to an exchange where you can trade them for FUN (or any other coin). In my opinion if you intend to buy lesser-known coins like FUN, ETH is the best choice to buy here. Why? Well, with regards to LTC, the reason is clear: other exchanges like Binance offer direct trading pairs for BTC and ETH, but not LTC or any other currency. What this means is that you could directly exchange your ETH for FUN, or your BTC for FUN, but you’d have to perform another step if you wanted to trade your LTC for FUN (and that means more fees!). Obviously we don’t want to waste even one cent if we can avoid it, so LTC is out. Now is the time for you to make your Binance account. Follow the link and create an account using a strong password (this should be different than the one you used for Coinbase!). There are other places where you may be able to buy FUN (Changelly, Kraken, EtherDelta, HitBTC, KuCoin, etc.). I cannot directly recommend most of these exchanges as I don’t have much experience with them at this point — however, I can say that I have used HitBTC and KuCoin and they have worked well for me. This guide focuses on Binance because my experience there has been 100% positive — I have transferred coins in and out of their system many times with no problems. Once you click Send, you will need to wait a little while. Without getting too technical about it, exchanges want to be as secure as possible. Thus, when you make a deposit, they wait for multiple “confirmations” from the network before allowing you access to your funds. You can view the progress in your Binance account by clicking Funds and then History. Do not be alarmed if nothing shows up at first! There are many reasons there might be a slight delay. In general you should see the transaction show up within a few minutes, with the current number of “confirmations” next to the number of required “confirmations” next to it. Be patient — your FUN is nearly in hand! Once you have the required number of confirmations, it’s time to trade your ETH to FUN. This is blessedly simple. In the front page of Binance, click “ETH Markets.” Search for “FUN/ETH” in this list, and click it. Now you are on the trading page. In the bottom left under “Buy FUN,” click “100%” below the “Amount” field. This indicates to Binance that you’d like to trade all of your ETH for a commensurate amount of FUN for no more than the price listed above. The price field is automatically listed based on the current market. If you like, you can change it to a different price, but like any market it’s not guaranteed that someone will buy at the price you’d like. Your order will remain open until it’s been fully filled or you cancel it. There are several options here such as Stop-Limit orders, etc., but this is outside the scope of this guide. In this case, you are simply placing a “Limit” order for some FUN. If you want to be done now, you can be — but there are more steps if you want to be security-conscious. You may want to check under the “Orders” and “Order History” tabs that the order went through — if you placed a Limit order at the default price, it probably did. Once you have your FUN in your Binance account, you can see them under “Funds” → “Deposits Withdrawals.” You can click “Hide 0 Balances” at the top to clean up the screen of coins you don’t own, and you can see an estimate of the overall converted BTC and USD value of your account at the top right. In Binance, go into the “Deposits & Withdrawals” tab, then click “Withdrawal” to the far right of the “FUN” row. By now it should be clear what you’re looking at — fields that let you input the address to send the coins to, and how many coins to send. For your convenience, there is a “Max” button to the right of the Amount field. Note that once you click “Submit” you will need to use your two-factor authentication via Google Authenticator, an Android app. I recommend you do not use your actual day-to-day phone for this purpose. These days you can get an inexpensive Android phone for around 30 dollars — this is an investment worth making for security purposes. You can keep the battery removed from the phone when you’re not using it, and connect it to a network only for cryptocurrency purposes. As a bonus, if you’d like, you can use this phone for the Coinomi wallet when dealing with other cryptocurrencies. It is possible to get FUN working in Coinomi right now and the process is fairly straightforward. In my opinion this is the preferred method, especially if you’re willing to buy an Android phone solely for cryptocurrency use. However, if you’d prefer to use a desktop wallet, I have written an easy-to-follow comprehensive guide which walks you through how to use MetaMask and MyEtherWallet to store any ERC-20 token, including FUN. Be advised that the information here only scratches the surface on FunFair and cryptocurrencies in general. I recommend you read as much as possible. Cryptocurrencies are the future, and if you’re reading this guide you are already light-years ahead of the curve.